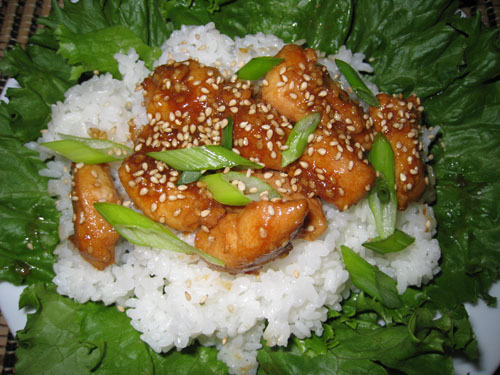 A while ago I came across this recipe for sesame chicken that sounded really good. I really liked the sound of using the pineapple juice along with the soy sauce, brown sugar and ginger in the sauce. This dish was really easy to make with just a few minutes of prep, some marinating time and a few minutes of sauteing. I really enjoyed the sesame chicken! It was sweet, salty and tangy all at once! I am already thinking about new variations of this dish. Why not throw in some sliced pineapple? How about trying different sweeteners? All honey? Maple syrup? How about working in some teriyaki sauce? Maybe a little bit of chili heat? Mix the soy sauce, pineapple juice, honey, sugar, ginger and chicken in a ziplock bag and marinate in the fridge for about an hour. Add the chicken and marinade to the pan and saute until the chicken is cooked and the sauce begins to thicken. Serve on cooked rice and garnish with the sesame seeds and green onion. Kevin, that looks so delicous, I can imagine the savoury, sweet and tangy flavours. I think sesame with chicken is one of my fav pairings. When you mentioned pineapple, it reminded me of my mom’s sweet & sour sauce that she pours usually over battered fish. Looks great Kevin! I love Nikki’s food 🙂 I make my sesame chicken with honey and teriyaki sauce, actually. I loooove the Soy Vay teriyaki. Mmm. WOW! That sounds awesome, I wish that’s what we were having for dinner tonight~ definitely bookmarking this one!! 🙂 THANKS! Kevin, that looks great! Nice presentation. I was going to say add some chilis! I like spice. I would probably kick up the sesame flavor some more with a splash of toasted sesame oil. Teriyaki? Sure. How about a bit of sweet mirin? Kevin, a wonderful weeknight meal and easy enough to marinate. That looks great. I’m adding that to my list to make soon! Great recipe. Maybe can substitute part of the honey for some citron honey/jelly. my mom have a similar recipe of pineapple sauce, soy sauce, and sesame seeds on pork cutlets..but i love this idea of yours on chicken! !top over my rice i will not hesitate to ask for another serving!! I love chicken with sesame seeds. I have bookmarked this recipe Kevin. I love seasame chicken! Thanks for sharing! This sounds great Kevin. I have never tried making Sesame chicken at home before. That looks so good. I like that the chicken is not breaded and deep fried like it is at some restaurants. This looks much lighter. You have me craving some Chinese food now!! That looks like my dinner next saturday! Thanks Kevin. i am a fan of sweet/sour/salty combo. this is great. Here’s a fantastic dish, I haven’t had in a very long time. It’s one of those dishes I would always order but never made myself. Will be added to to my growing list of things to cook! i love sesame chicken. this recipe looks so easy too, making it even better! I made this tonight and it was very tasty – I did use fresh ginger, however, which made it super gingery. I’ll half it next time. I made my own version of this recipe. So good! Thanks for the inspiration. Last night I made this dish for dinner. I was only able to marinate it for 20 minutes (I forgot it needed to marinate) and I didn’t have any ginger, but it still turned out fabulous! So flavorful without being unhealthy. Gotta love that. Thank you for all of your wonderful recipes and the beautiful pictures. I have several others on my menu for this week! So much better than what you typically find in Chinese restaurants (at least the MSG heavy ones in my area!) I added minced garlic and a little bit of Sriracha chili sauce to the marinade for a subtle element of heat. Love how the nicely the ginger flavor comes through in this dish. Kevin, I truly love your blog. What a fabulous site. Every time, and that means daily, that I visit the site I am caught up going from one recipe to the next and enjoying the feast! Thanks so much for all your efforts, they are greatly appreciated. Kevin, I truly love your blog and this amazing site. Every time, that is daily, that I visit I am caught up going from one recipe to the next. They are terrific recipes and I savour the feast. Thanks so much for all your hard work and for sharing your insight.